Andrew Bynum blocks Kevin Love's shot. The Lakers have won 11 of 12 games since the All-Star break, but Friday night’s win against the lowly Minnesota Timberwolves may have been the toughest victory of the bunch. The Lakers overcame Kobe Bryant’s struggles with his sore ankle, and Andrew Bynum’s fourth quarter ejection to beat the Wolves 106-98 at Staples Center. Pau Gasol scored 25 points and four blocks on 12-17 from the field, as the Lakers battled back from an early 10-point deficit. 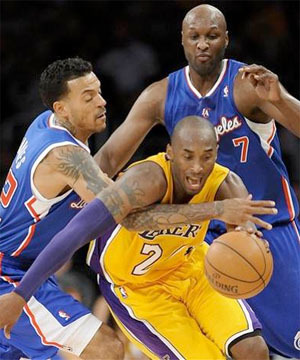 Bryant struggled with his shot most of the night but did finish with 18 points, five assists, and four rebounds. 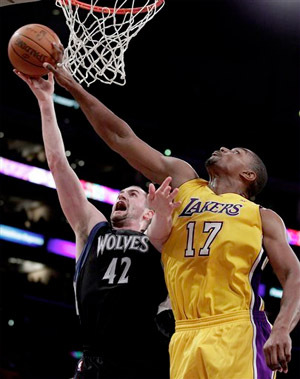 Bynum had 10 points and 14 rebounds before he was tossed in the fourth quarter after a Flagrant 2 foul call on Michael Beasley. Bynum, who again was dominant on the defensive end again, struggled a bit offensively and was clearly frustrated late in the game after missing a dunk and committing an offensive foul. As Beasley drove to the rim, Bynum jumped up and threw out his hip and elbow into Beasley who went crashing to the floor, but did get up angrily very quickly. Bynum was ejected after officials checked the replay. Beasley made both foul shots, but left the game moments later with a sore hip. At the time the Wolves still held the lead. Bryant who scored just six points in the first half, scored 12 in the second half, and hit some crucial jump shots late to get the Lakers back out in front. He didn’t start the second half, as it appeared he was getting extra work done on his sprained ankle during halftime. Shannon Brown started the third quarter and finished with 14 points off the bench. With the Wolves clinging to an 89-88 lead, the Lakers went on a 12-6 run, highlighted by a Lamar Odom three-pointer with just over 1:30 left in the game that put the Lakers up by their biggest margin of the night 100-94. Minnesota could get no closer than five in the final minute as the Lakers extended their winning streak over the Timberwolves to 15 games. The Wolves haven’t beaten the Lakers since March of 2007. For the game, the Lakers shot 47.6% (40-84) from the field, including 8-19 (42.1%) from beyond the arc. They held Minnesota to 44.3% (39-88) from the floor and just 7-21 (33.3%) from long range. The Wolves did win the rebound battle 45-44, but actually held a double-digit rebound lead early in the game. Wesley Johnson led all scorers with 29 points on 11-21 from the floor for Minnesota. Michael Beasley had 18 points and seven rebounds before he left the game, and Kevin Love tallied another double-double with 15 points and 13 rebounds. The win put the Lakers in sole position of second place in the Western Conference at 49-20, one full game ahead of Dallas, who lost to San Antonio 97-91 on Friday. The world champs continue their seven-game homestand on Sunday night against the surging Portland Trail Blazers. Los Angeles has beaten Portland twice already this season. They could however be without the services of Bynum, who may face a league suspension for his flagrant foul on Beasley. That could pose a problem against the suddenly very big and healthy Trail Blazer team.